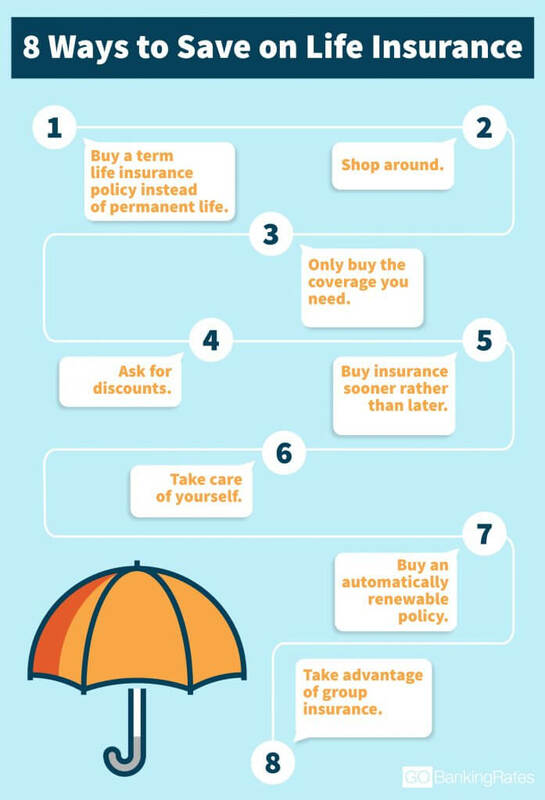 Try these tips to save money on a life insurance policy. Life insurance is a promise from an insurance company to pay a specified sum to someone you choose — your beneficiary — at the time of your death. One of the best uses of life insurance is to protect anyone who relies on you financially, such as a surviving spouse or dependent children. Life insurance also has more advanced estate planning uses, such as preserving cash flow to pay estate taxes. Two basic types of life insurance are available: term and permanent. Term life insurance remains in force for a specified period of time. Permanent life insurance includes a savings component, which you can withdraw or use to help pay premiums. Life insurance can vary widely in cost, from as little as about $500 a year for a young, healthy term applicant to 10 or 20 times as much for an older, permanent life applicant — and even more for smokers. In order to get the right amount of coverage without spending more than necessary, here’s how to save money on insurance for a life policy. The easiest way to save money on life insurance is to buy a term life insurance policy instead of a permanent one. Term insurance offers no savings component, which means all of your money goes toward insuring your life. Permanent life insurance lasts a lifetime instead of 10 or 20 years like a term policy. In addition, permanent insurance — including whole life insurance — always has an additional savings or investment platform, and that costs money. You can visit an agent for an in-person evaluation, but many insurance issuers will give you quotes over the internet if you provide your basic medical and demographic information. However, the lowest price you receive might not be the best policy for you. Before you commit, consider a range of factors — including the insurer’s financial stability and its claims-paying policy. Insurance can be expensive and you shouldn’t buy more than you need. But you might not quite know the answer to the question, “How much life insurance do I need?” To figure that out, decide what you’ll want covered in the event that something happens to you. Generally, people buy life insurance for two main reasons: to replace lost income or pay off debt obligations after they die. To replace lost income, one formula suggests that you should buy coverage equal to 15 times your current salary, which means your beneficiary would likely get 75 percent of your salary. If your goal is to pay off existing debt after your death, don’t overlook any of your obligations, including your mortgage, credit card debt, tax liens or student loans. When you’re shopping around for life insurance, don’t forget to ask what discounts are available — they might vary among companies. For example, some companies might offer discounts if you buy certain levels of life insurance, such as $250,000 rather than $200,000. One insurance company offers a 15 percent discount on certain policies if you can show you lead a healthy lifestyle. Others might offer discounts of up to 5 percent if you enroll in an autopay program. One of the key factors in determining the cost of insurance is your likelihood of mortality. An insurance company calculates your average life expectancy by using actuarial tables based on historical and other data. As a result, the older you are, the more likely it is that your insurance premiums will be higher. Buy a policy when you’re relatively young and your premiums will probably be lower. You can’t stop yourself from aging. However, you can make healthy lifestyle choices that might put you in a less expensive insurance category. For instance, smokers have a higher mortality rate than nonsmokers, and they have to pay higher insurance premiums. If you’re overweight, you might also fall into an unfavorable rate category and have to pay more. By modifying these behaviors, a life insurance candidate can turn penalties into savings. If you’re young and healthy when you apply for term insurance, try to get a policy that’s guaranteed renewable. You’ll pay more for this type of policy as you age, but the insurance company won’t raise your rates based on your overall health. This can result in tremendous cost savings if you end up with a serious illness or your health rapidly deteriorates. Although insurance isn’t a product you can buy in bulk, you can participate in your employer’s health insurance plan — which typically includes life insurance — and benefit from group rates and from your employer paying part of your premium. Whether or not you can get cheaper insurance on your own will depend on your individual risk factors — such as age and health — but you might find that group insurance saves you money. Click through to read more about how to find the best and cheapest health insurance. What’s the Difference Between Coinsurance and Copay? Here's a rundown on the bill that would replace the Affordable Care Act.